As the premier spot online for listing and booking short-term housing accommodations, Airbnb has already seen huge growth since being founded in 2008. It announced just last week that it had hit 10 million guest nights booked in total, with 200,000 active property listings on the site. But now that Airbnb has kind of reached critical mass, it wants to make discovering new spaces a little easier, a little more social, and a little more joyful for its users. To do that, it’s rolling out a brand new site design and a new iPhone app, both of which are designed to let users navigate lists of popular destinations, editorially curated content, and spaces that their friends like. It’s also introducing Wish Lists, enabling its visitors to create Pinterest-like collections of spaces to stay in. Airbnb’s new Wish List feature takes the place of Favorites, which few users took advantage of, according to lead designer Shaun Modi. Even when users knew about Favorites, the feature was a little flimsy and rarely used. Wish Lists are designed to be a lot more robust, allowing users to “collect” or “curate” their favorite Airbnb destinations into themed groups. Users who travels frequently to New York, for instance, could create a Wish List of their favorite spaces in that city. Or they could create a Wish List of vacation spots they’d like to visit with their significant others. Or users could create group of locations that they’ve already stayed at to share with friends on the site and on Facebook. Yeah, there’s sharing on Facebook. The Airbnb team is touting pretty deep integration with Facebook Open Graph, which will make Wish List updates available for viewing by Airbnb users’ friends and family — as long as they’ve connected the two and opted in to sharing. Once users have chosen to share, Wish List items will appear in their Facebook Timelines. When their friends click through those listings, they’ll be taken to a special page that showcases properties shared on the site. That is, of course, meant to inspire a new group of users to check out the site and maybe stay in places they never knew existed — or at least create their own (socially shareable) Wish Lists. The addition of Wish Lists, as well as the new Facebook integration, is part of a larger redesign that is meant to make discovering new destinations easier and more engaging. Airbnb has commissioned more than a million professional photographs of its properties, and it’s taking advantage of that, with beautiful large-scale photos. It’s also adding infinite scroll, letting users browse through spaces without having to click through multiple pages. 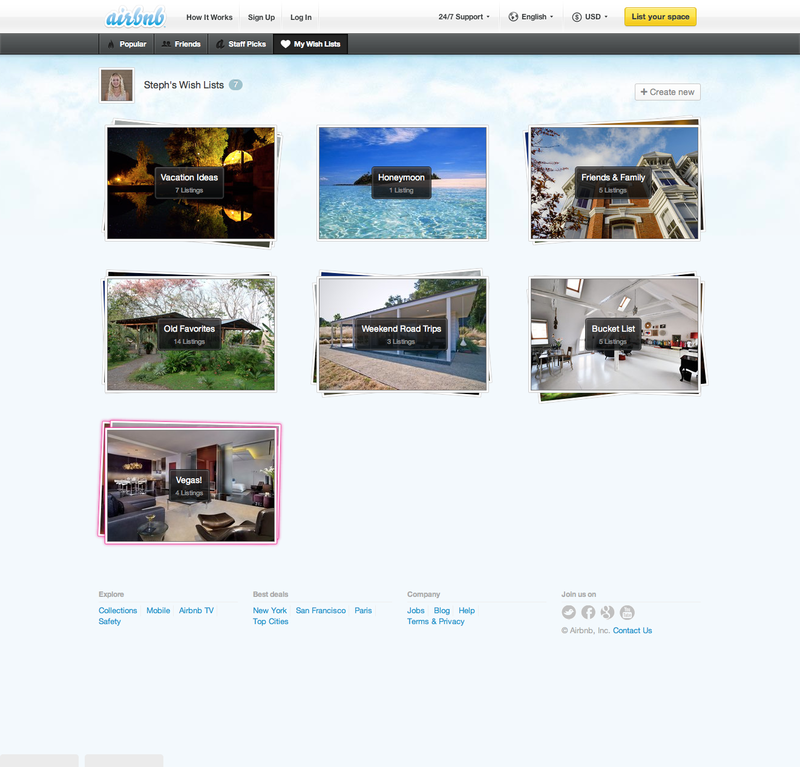 The new design introduces a collection of popular and featured properties to browse through. 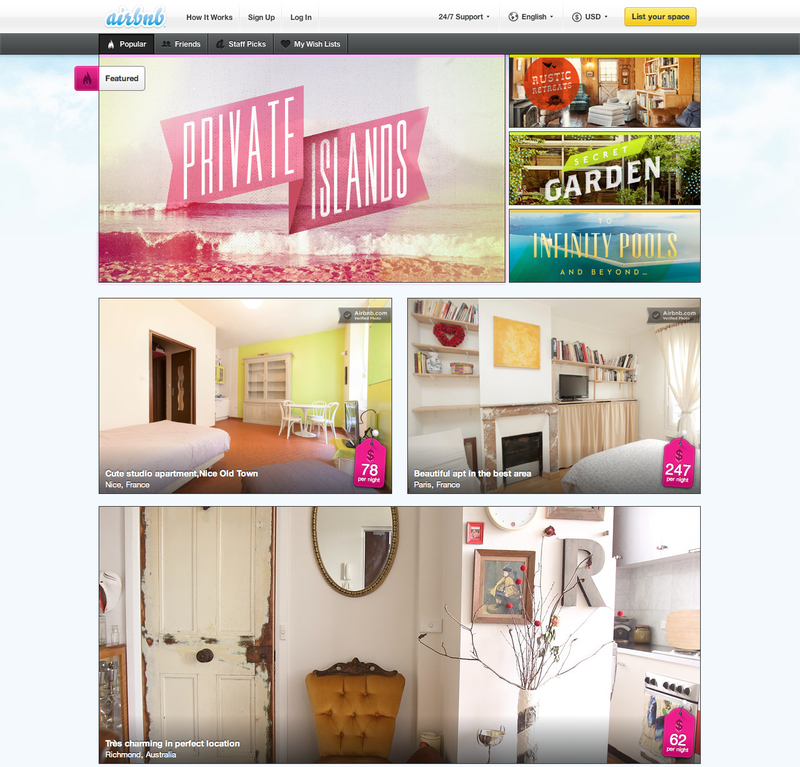 The old Airbnb site was all about search, but the redesign leverages all the new lists that are created by users, as well as curated lists from the Airbnb staff and tastemakers like Ashton Kutcher, Jack Dorsey, and Yves Behar. It also has a page listing popular properties, which are highlighted with larger photos and maps to showcase destinations that users might not have thought about. While a lot of focus was put on building a great new web experience, Airbnb is also issuing an update to its popular iPhone app. The new app adds the ability to add spaces to a wish list, as well as the same “popular” and “featured” options for checking out new destinations. Altogether, the new design, new app, and new Wish List functionality are all meant to inspire users new and old to be more aspirational and to step outside the search paradigm that previously ruled the site. That is, not just to show up when you need a place to stay, like, next week, but to check out new places even when you’ve got nothing planned, and to maybe even plan a trip based on a cool place you found. Will the redesign work? It’s hard to tell at this point, but hey, at least it looks gorgeous.